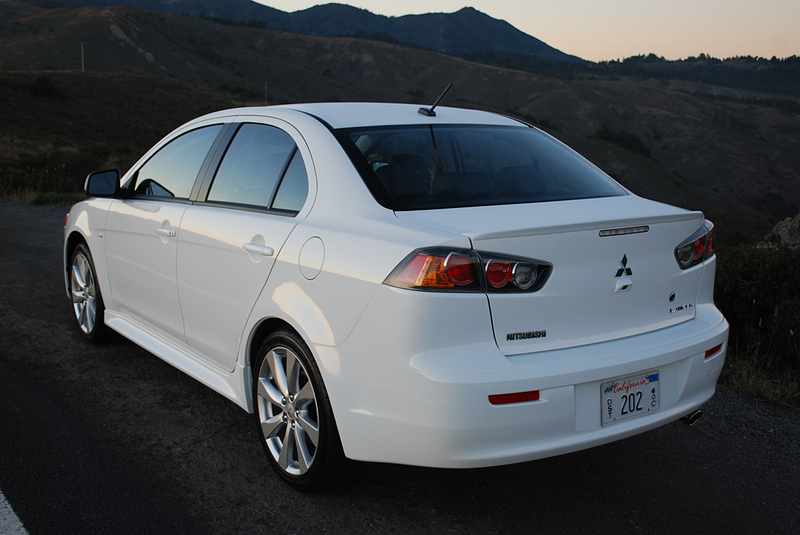 Although eight years have passed since Mitsubishi last contested the World Rally Championship with the Lancer, this compact sedan still retains its WRC pedigree. 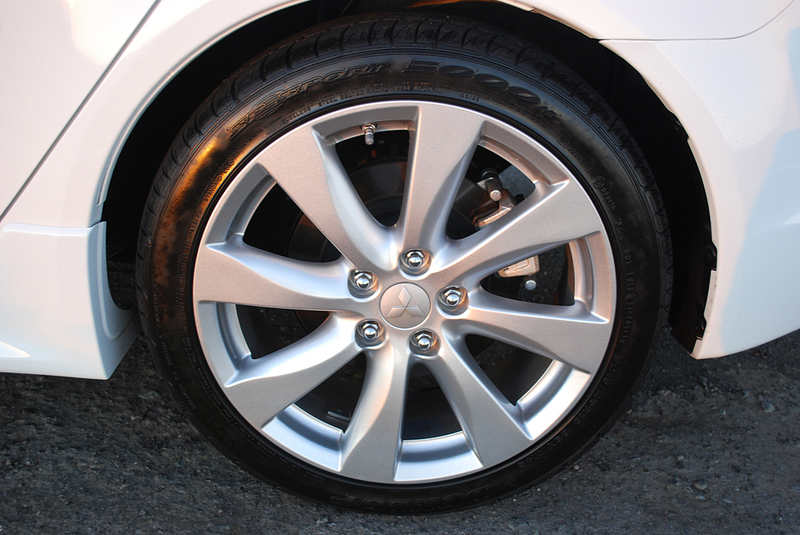 With 11 different Lancer combinations available, picking the right one for your needs can be problematic. The range begins with the $16,000, front-wheel-drive DE sedan and tops out with the $35,000 all-wheel-drive GSR Evolution. Our $21,445 front-wheel-drive GT, with its 2.4 liter 168hp engine, represents a good compromise between the entry level 2.0 liter, 148hp DE and the line topping, turbocharged, 291hp GSR. The GT has enough urge to accelerate you out of tight passing situations while posting excellent mileage numbers (26MPG combined). Although our sample GT was loaded with $5,150 worth of options, you can certainly get by without the pricey ($3,300) Touring Package or the $1,850 Navigation System. Although I’ve never been a fan of CVT transmissions, the constant velocity unit in the GT is staged so precisely that you’d swear it contains gear sets rather than belts. In keeping with their WRC tradition, Mitsubishi supplies the GT with racing style, cast aluminum “Sportronic” paddle shifts which are attached to the steering column rather than the wheel. These silver elephant ears facilitate up and down changes which are easily accomplished even when the steering wheel is cranked over hard. The ride quality of the GT is stiff and well snubbed thanks to its sport tuned suspension and low profile, high performance tires and wheels (215/45R18 Dunlop SP Sport 5000). Although the GT jiggles over pavement imperfections it handles corners with great precision. The suspension architecture, which combines MacPherson strut front with multi-link rear, is independent at both ends, and uses front and rear sway bars for added stability. Although our GT’s 3 month free subscription to SIRIUSXM radio had already expired, the Rockford Fosgate 9 speaker, 710 Watt premium stereo (included in the Touring Package) could still be used for CDs or MP3 hookups by cantilevering the head unit open. Doing so reveals a single CD slot, plus a pair of SD card slots. A 10 inch subwoofer located in the trunk keeps track of the baseline. 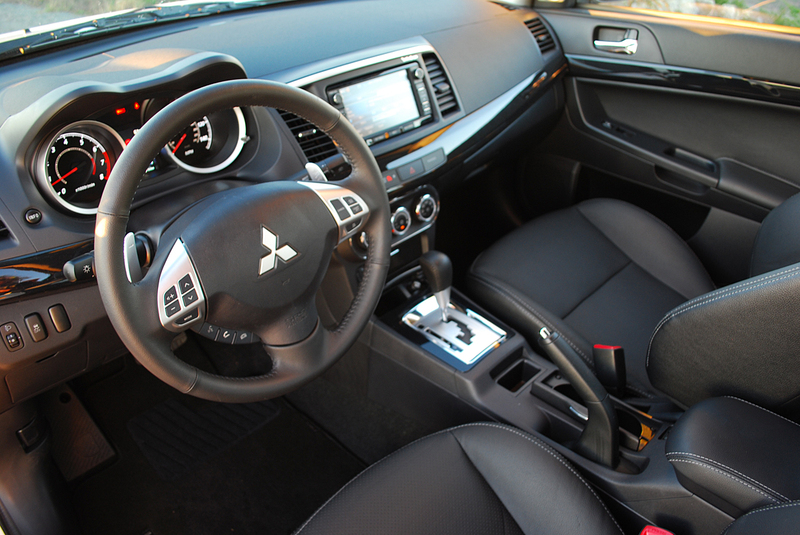 Even when supplied with the leather seating surfaces of the Touring Package, the interior of the Lancer seems bland and somewhat dated. Neither the front nor the rear seats will elicit rave comfort reviews from occupants. Although the rear seats fold flat, the sizeable partition separating trunk from cabin interferes with storage capacity. On the positive side, the Lancer’s tall greenhouse permits excellent sight lines in all directions. Thanks to this vision enhancement and the spunky 167lb.-ft. of torque from its large displacement 4 cylinder engine, the GT is easy to maneuver in tight city spots. 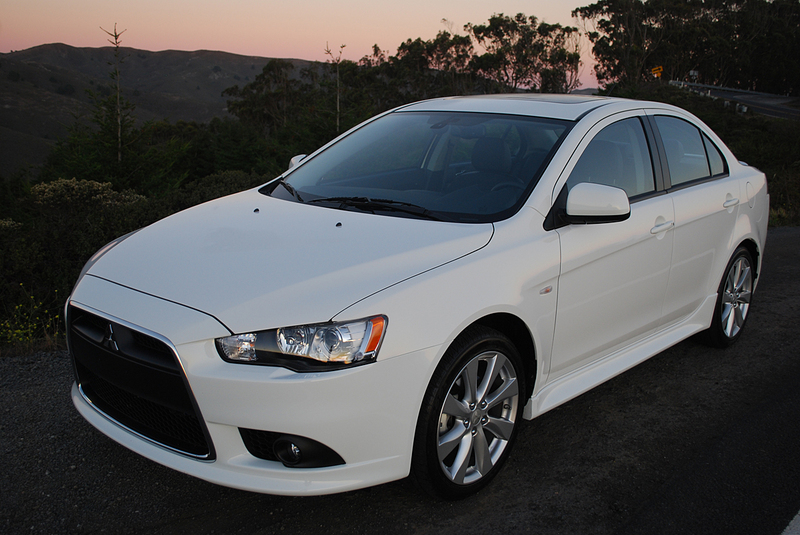 The Mitsubishi Lancer remains an excellent platform for the driver concerned with car control. 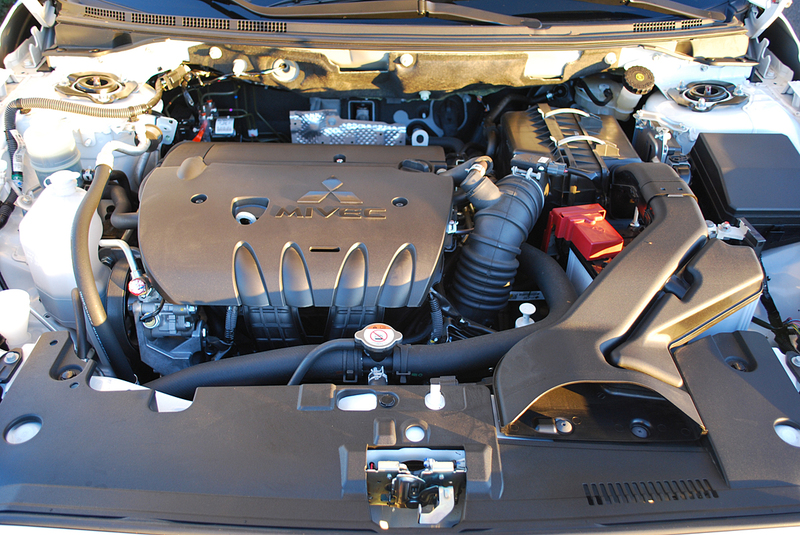 Its quick reflexes, exceptional shifting, and torquey motor convert this innocuous looking family sedan into a rapid transit module that shows Mitsubishi hasn’t yet forgotten the art of driving hard.